Note: Clean Air Act regulations covering CO2 emissions performance of new power plants require new coal plants to apply carbon capture and sequestration (CCS) technology. The coal technology with 30% CCS removal complies with current regulations and the 90% CCS over-complies. The coal plant with 30% removal is assumed to incur a three percentage point adder to its cost of capital to represent the higher risk of investment in a plant of that design, which could be significantly disadvantaged by possible future policies to limit greenhouse gas emissions. Figure shows capacity-weighted averages where available. Cost is one of the key factors influencing the choice of fuels and technologies used to generate electricity. Capital, maintenance, operating, and financing costs often vary significantly across technologies and fuels. In addition, regional differences in construction, fuel, transmission, and resource costs mean that location also matters. While simple metrics are sometimes used for cost comparisons, it is important to understand their limitations. Levelized cost of energy (LCOE), one common metric for cost comparisons across projects and technologies, considers a plant’s expected lifetime and operation cycle and amortizes those costs over an assumed financial lifetime. Because LCOEs do not include contractual terms on price, duration, or price inflators, they should not be directly compared with other prices such as power purchase agreements. Power purchase agreements may involve project- or corporate-specific finance terms, reflect differing contract terms with the power purchaser, or reflect the value rather than the cost of the energy. In addition, federal, state, or local tax incentives or mandates may affect some costs associated with building certain power plants. EIA’s published LCOE estimates are presented with and without relevant federal tax incentives, but they do not capture the effects of state or local programs, such as payments for compliance with state renewable portfolio standards. LCOE comparisons have some notable limitations. For example, when comparing new capacity to existing capacity, some types of existing plants that may have been expensive to build but have relatively low operating costs can continue to operate competitively, even though the LCOE for new plants of these types may be higher than the LCOE for other technologies. Different generation technologies also operate in different ways: some are dispatchable, or can be scheduled, while others are dependent on energy sources, such as wind and solar, that are available intermittently. Some plants operate around the clock, while others are likely to operate only during times of high demand. Because electricity prices differ throughout the day, the timing of a plant’s output affects its cost recovery. Also, dispatchable generating technologies (such as coal-fired steam or nuclear steam plants, combined-cycle plants, and simple-cycle combustion turbines or internal combustion engines) provide both energy and capacity services to meet daily and seasonal fluctuations in demand. Note: For more detailed information, see note under the first figure. 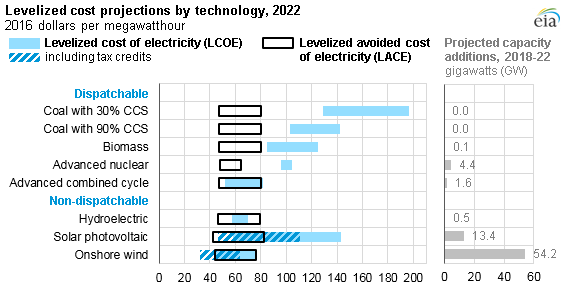 Another cost concept, the levelized avoided cost of energy (LACE), attempts to measure the value to the electric system that certain technologies provide. LACE reflects the cost that would be incurred to provide the same supply to the system if new capacity using a specific technology were not added and used. For example, if a hypothetical new natural gas plant were not constructed, other technologies may need to be added or the utilization rate (and fuel use) of existing plants may need to be increased to meet the energy and capacity services that the hypothetical new plant would have provided. A technology is generally considered to be economically competitive when its LACE exceeds its LCOE. 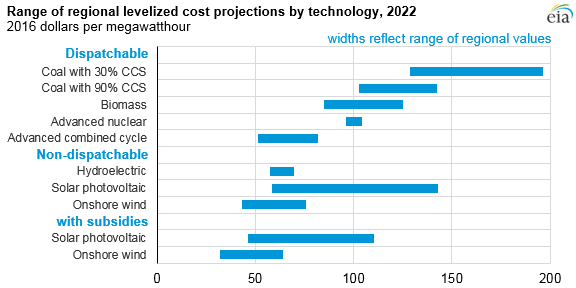 The EIA models that develop the electricity projections in the Annual Energy Outlook identify the least-cost capacity addition and dispatch strategies to meet energy and capacity requirements in each of 22 electricity market regions given the technology costs, fuels costs, and the daily and seasonal load patterns for each area. Although EIA does not directly apply the LCOE and LACE in its modeling, EIA calculates both LCOE and LACE for several technologies for all regions to provide insight into factors driving capacity addition and dispatch decisions. These calculations are available in the Levelized Cost and Levelized Avoided Cost of New Generation Resources in the Annual Energy Outlook 2017 report.